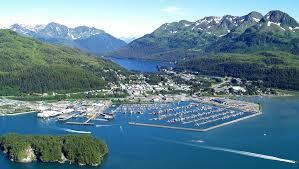 Copper River Salmon is hosting me and my mom in Cordova, Alaska this summer! I have never been to Alaska, and I am super excited. We get to go and experience Cordova, a remote fishing village that can only be reached by boat or small plane. We are going salmon fishing too! I’ve heard a lot about Cordova from my neighbor who used to live in Alaska. He says that it is one of the most beautiful places in the whole world. I am very excited to have this amazing trip. This is Cordova. 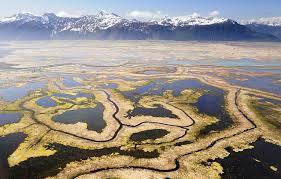 It is very small, and nestled right at the mouth of the famous Copper River. From this picture it looks like the marina is bigger than the town! Sadly we won’t see much snow because my mom and I are going in the summer, but we will still have a wicked awesome time. This is the Copper River. It looks like it has a lot of bends, and it seems like it would be hard to navigate by ship. My hands are shaking as I’m typing because I am so excited!!! Look at the breathtaking views. The only thing that can get better than this, is seeing it in person. 🙂 During our stay in Cordova, Copper River Salmon has planned out quite the itinerary for me and my mom. Last year’s itinerary included salmon fishing, kayaking, a salmon barbecue, the history of Copper River Seafoods, and even a glacier trip! I just hope the glaciers don’t melt before I get there. Stupid global warming! I’ve seen pictures of two different kinds of salmon fishing so far. I have seen netting and just plain rod-fishing. I’m curious as to what kind of fishing we will be doing in Alaska. It seems to me like netting is kind of unfair. There is no struggle. It seems too easy for the fisherman, so I hope my mom and I will be rod-fishing. Fishing is all about the fight. Each fish has different memories that come with it. 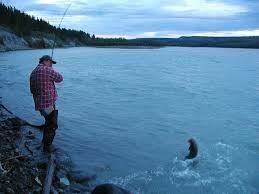 I can’t wait to be catching salmon with the pros in Alaska. All of the desolate land in Alaska seems so cool. There are vast tundras in between mountains and the ocean, filled with animals as abundant as rocks on the ground. While I’m in Alaska it would be cool if I could ride a dog sled. I have always wondered how fast dog sleds can go. The Iditarod Trail Dog Sled Race every year is so cool. 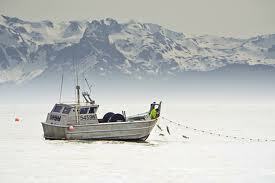 It runs from Anchorage to Nome, and is around 1,100 miles long. The race is the most popular sporting event in Alaska, and the top mushers and dogs are celebrities. The teams race through narrow mountain passes, over flat tundras, across rivers, and through dense forests. The thrill of the Iditarod Trail Dog Sled Race is contagious! That is some good, quality salmon right there. I personally don’t like skin though when I’m eating salmon. This picture reminded me of Pike’s Place Market in Seattle, Washington. 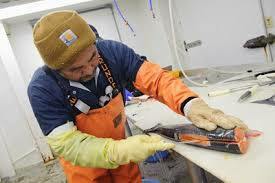 There are tons of fish and other foods piled onto ice in the cramped market. It’s causes quite a smell, believe me. That is a perfect fillet. 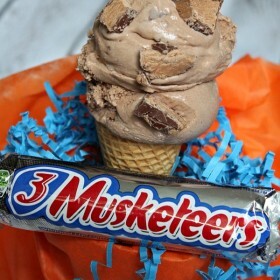 Does that not make you hungry? When I’m fishing in Alaska, I should bring some rice and make a piece of nigiri (sushi with just rice and a small cut of fish) with some salmon while I’m on the boat. 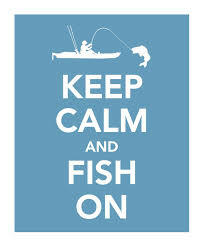 Keep calm and fish on! I totally have to get this T-shirt. I’m sooo excited for Alaska! 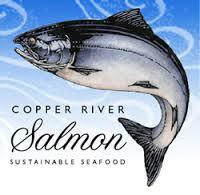 Thank you Copper River Salmon for inviting us on this very special trip! 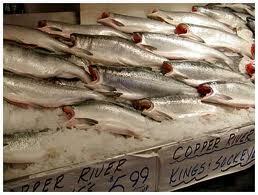 If you guys have any questions about Copper River Salmon you can visit copperriversalmon.org What’s your favorite type of fish? And even a kid that turns 13 on Tuesday can get invited to go to Alaska… Like Me! Note: I didn’t take any of these pictures- I searched the internet and borrowed them for my post. I hope that’s ok with the photo owners! My cousin lives in Alaska and she loves it! Anytime she posts pictures of being outside, it is so beautiful!! Have fun when you go there! welcome to the Great Land, Brooks! 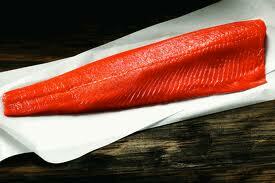 Copper River Red (Sockeye) salmon is the best! You’re going to love Cordova and Prince William Sound. Be sure and try some fresh delicious PWS spot shrimp! I’m going to Farmer’s Market in the morning for my first fresh shrimp since last fall. My very favorite two proteins. Best in the world, I think. I think your trip will be life altering. Have fun and bon appétit! Have a wonderful trip! We will all look forward to reading your posts upon your return. You can do a tutorial on how to gut a fish! You will have a wonderful time. Alaska is fascinating! Look for some native crafts. My favorites are the sculptures done by locals – not mass produced or imported. By buying those you are supporting the local economy. 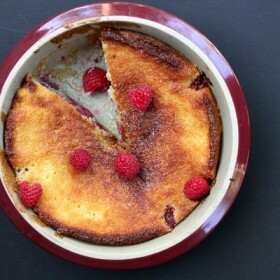 My ailing computer finally let me look at what’s been going on at RecipeBoy’s website.Looking good. I loved reading all about your future trip to Alaska. Sounds like you learned a lot about Alaska already. Thanks for sharing.